No doubt we have entered another era. A technological leap has dis-ruptive effects on society in global dimension while undermining existing economic models and political institutions. Rapid qualitative strides made in the development of artificial intelligence test the adaptability of all co-horts of population and create new challenges for lifelong education. In the previous phases of technology revolution, a physical labor was reduced in favor of an intellectual one, whereas today’s technology substitutes more and more of intellectual tasks in our professional and daily life. What will be the character of work in the coming years and decades? Experts and pundits compete in gloomy predictions of how deep the loss of jobs caused by technology would be. Is it a real threat and should we be concerned? In this issue dedicated to “the future of work” we present the topic from vari-ous perspectives for your kind consideration. Are we approaching a moment in the history of mankind relieving us of most of the toil and labor and release new opportunities for human creativity? Shall we finally enjoy a life without labor, entitled only to com-fort and convenience? For Karl Marx, labor was the constituting feature of humanity. His followers believed that labor-freed of alienation and exploitation caused by the private ownership of production means-would lead to full realization of human destiny and purpose of life. Contrary to this noble concept, totalitarian regimes institutionalized forced labor as a weapon. Today, some tend to believe that the liberation from the yoke of labor that was not realized by communist revolutions could be finally achieved now through a technological one. Would not mankind, freed of hard efforts to pursue more than pleasure and happiness, lose something fundamentally human? Seeking the answer and mapping the impact of technological changes on society in general remains one of the key areas of our interest at Aspen Institute. 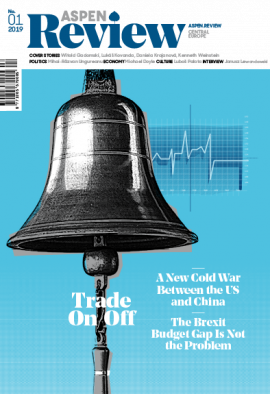 As in the past issues of Aspen Review, we publish articles on US pol-icy–this time on free trade under the Trump administration-and on Brexit negotiations. Recent legislative measures towards the judiciary and the NGOs by the governments of Poland and Hungary stirred a public con-troversy and attention abroad; we will continue to publish opinions about deeper causes polarizing political developments in Europe. In the interview with Alain Délétroz we offer an insight into European policies of the new French President Emmanuel Macron with special attention to Franco-Ger-man relations and French policy towards Central Europe. We hope to have a complementary view after German elections in the next issue. Stay tuned to Aspen Review!